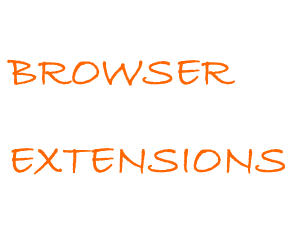 Browser extension is a kind of small program that add more functionality to your browser, but some extension can be very problematic to the extend that it change your browser setting that to suite the need the need of the programmer that program it, this kind of thing that it can change could be the default search engine, they way your bookmarks pages appears and even the appearance of the browser. What even annoy me most is the fact that this extension comes with some software that we download and install itself automatically without even your permissions. It happens to me sometimes ago, when I download a free software, after install it, I get to find out the browser I use to download that free software has change it appearance, it has also change so many setting on it and some unfamiliar icons has appear on the browser home page,, it tooks me almost a week before I get find out that it is an extension that install itself as a result of the free software I download with that browser, I think it`s the price I have to pay for downloading free software. Step 1: Open your browser that you want to delete the extensions from it. Step 3: After clicking on that bottom, locate Add-ons for fire fox and click on it and for Google chrome locate settings and click on it. Step 4: Locate extension and click on it on both browser. If you just want to disable the extension, click on the disable bottom just close to the remove bottom. Has this post helps you, if yes please it hear you opinion about this post in the comment box below, and please don’t forget to share this post with your friends on the social media using the social media bottom below.